LONDON (AP) — Archaeologists excavating near Cambridge have stumbled upon a rare and mysterious find: The skeleton of a 7th-century teenager buried in an ornamental bed along with a gold-and-garnet cross, an iron knife and a purse full of glass beads. Experts say the grave is an example of an unusual Anglo-Saxon funerary practice of which very little is known. 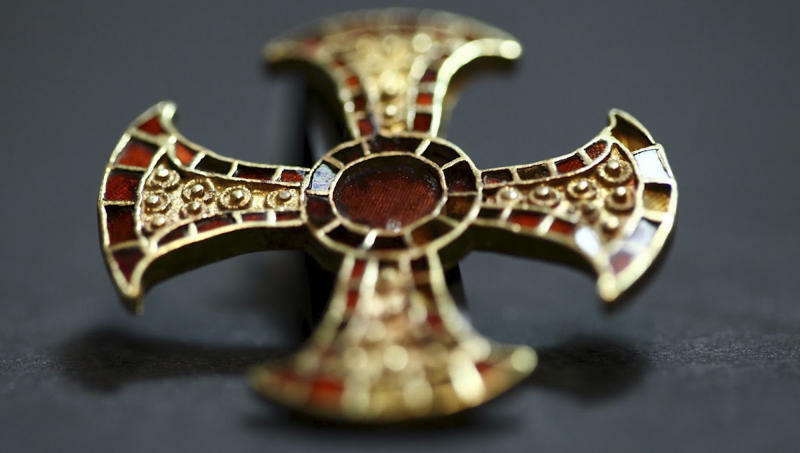 Just over a dozen of these "bed burials" have been found in Britain, and it's one of only two in which a pectoral cross — meant to be worn over the chest — has been discovered. One archaeologist said the burial opened a window into the transitional period when the pagan Anglo-Saxons were gradually adopting Christianity. "We are right at the brink of the coming of Christianity back to England," said Alison Dickens, the manager of Cambridge University's Archaeological Unit. "What we have here is a very early adopter." The grave, dated between 650 and 680 A.D., was discovered about a year ago in a corner of Trumpington Meadows, a rural area just outside Cambridge that is slated for development. Dickens said the teen's grave was interesting because it had a mix of traditional grave goods — the knife, as well as a chain thought to hold a purse full of beads — along with a powerful symbol of Christian devotion. The grave, she said, indicated "the beginning of the end of one belief system, and the beginning of another." The teenager's jewelry — a solid gold cross about 3 1/2 centimeters (1 1/2 inches) wide, set with cut garnets — marks her out as a member of the Anglo-Saxon aristocracy. She was about 15, but her skeleton hasn't yet been subjected to radiocarbon dating or isotopic analysis. Those techniques might help experts determine where and under what circumstances she grew up. 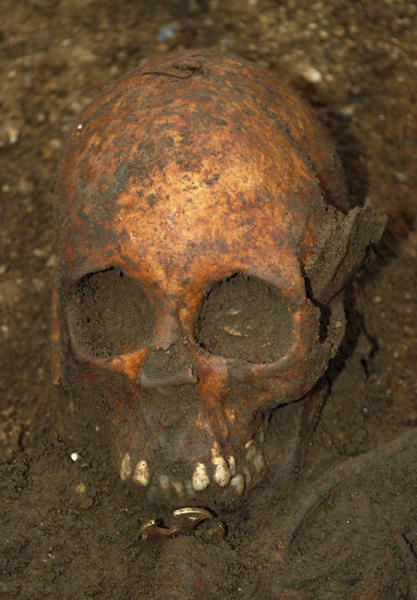 Howard Williams, a professor of archaeology at the University of Chester who is not connected to the discovery, said bed burials were very rare. He noted that they were an irregular feature of wealthy female graves in England and mainland Europe, suggesting that Anglo-Saxons may have looked across the Channel for inspiration. "It's part of a broader pan-European elite identity in life and in death," he said. Three sets of Anglo-Saxon remains were also found nearby, but it's not clear to what degree any of the people buried there were related. As for the bed itself, there's little left of it other than its iron fittings. The rationale behind bed burials remains a matter of speculation. "The word in Old English for 'bed' and 'grave' is the same because it's 'the place where you lie,'" Dickens said. "It is interesting that you have that association. You're lying there — but just for a much longer time, I suppose."